An iPhone application can help improve your brand awareness, increase your marketing reach and help you acquire data about your customers. Most consumers are eager to make purchases using their mobile but many companies do not offer them a platform able to meet their needs. Operate your app remotely: By hosting your app in the cloud you gain access to the excellent IT infrastructure that your host has put in place, allowing your employees and customers to access your app anywhere and reducing your own IT overhead. Take payments anywhere: By adding in card reader functionality your employees will be able to use your app to take credit card payments using their iPhone. Grow your customer base: Gain access to a market full of potential new customers with your iPhone app. Meet and exceed customer expectations: Today customers expect to be able to download an app that will communicate deals and specials to them, as well as allowing them to order by mobile. Improve your customer service: An iPhone app gives another channel for customers to communicate with your company and provide feedback. Gain access to new revenue streams: Increase your revenue through eCommerce and advertising. Through strategic planning at every step of the development cycle New Media Guru can develop high-quality mobile business applications that will increase your revenue. 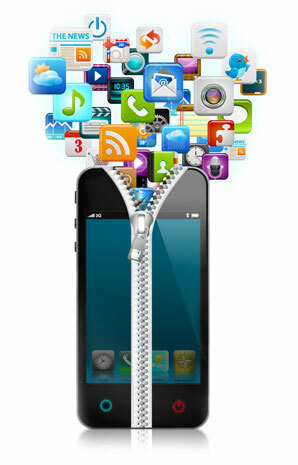 We can create a stylish and functional app, taking your vision and developing it into a fully-fledged app.